Dr. Toyos received his Bachelors and Masters Degrees from Berkeley University and Stanford University, respectfully. He received his Medical Degree at the University of Illinois, College of Medicine, where he was Class President and graduated with James Scholar Academic Honors. 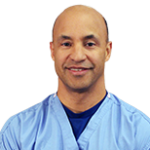 He completed his Ophthalmology Residency at Northwestern University Medical Center and Chicago Children’s Hospital. Dr. Toyos is one of the leading refractive surgeons in the nation. Not only has he performed over 20,000 LASIK procedures in West Tennessee, but he was also one of the first surgeons to perform EpiLASIK in the United States. EpiLASIK is a technology used for patients who are not LASIK candidates. Dr. Toyos is a member of the American Medical Association, American Academy of Ophthalmology, American Society of Cataract and Refractive Surgeons and the European Society of Cataract and Refractive Surgeons. He is board certified by the American Board of Ophthalmology and the National Board of Medical Examiners. Before starting Medical School, Dr. Toyos designed science curriculum for high school and college students which won him a National Teaching Award. He lectures both nationally and internationally on surgical techniques, medications and new technologies. Dr. Toyos has authored several books and presented numerous research papers. He is also the President of the Sports Ophthalmology Society of America. Dr. Toyos has been a team Ophthalmologist or Consultant for the NBA, World Boxing Association, MLB and the NFL. He has been voted Top Doc by Trusted LASIK Surgeons and Trusted Cataract Surgeons.